Last Saturday was a fun day! We have accumulated equipment in my “corn crib” at the farm since we loaded the last container in September. I actually lost count and didn’t realize how much equipment we had!!! 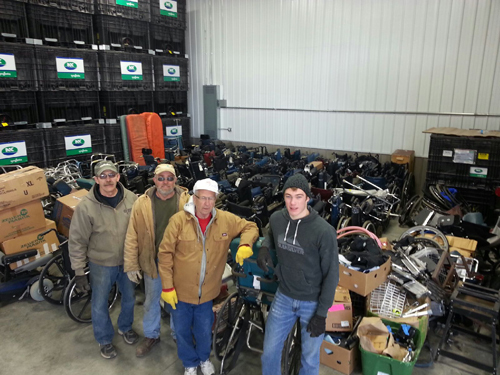 Some local volunteers joined us to move the equipment to a warehouse for loading. Ryan Walker, a good friend who has a “Syngenta Seed” business, was generous to lend us his warehouse last summer for staging and loading the last container. In the summer, a seed warehouse is EMPTY. In the spring, it is FULL of seed to be delivered to the area farmers for spring planting. I ASSUMED that his warehouse wouldn’t be an option for this load. I stopped by to visit him. He said, ”I will make room for the wheelchairs”. He added, “I’m not doing this for you Rick, I’m doing it for the Lord…this is really HIS warehouse!” Ryan truly has a heart for missions, and we sincerely appreciate his support! Thank you Ryan! So, Saturday we hauled 4 trailers (6×12) and 5 pickup loads of equipment to the warehouse. It was a huge load of blessings for the people that Bethel Ministries International serves in Guatemala! Our next “event” will occur this Saturday, March 29. We are inviting volunteers to come in from 8-12. We will do a complete inventory. The manifest for the container will contain a serial number from each wheelchair, crutch set and walker. The boxes of parts will be inventoried and listed on the manifest as well. While it sounds like a daunting task, it is actually quite fun. It is a great opportunity for groups and individuals to get together to SERVE! It is also a good opportunity for High School students to get “Silver Chord” volunteer hours! Matthew 9:37 “ the harvest is plenty and the laborers are few”. Well, the wheelchair harvest has definitely been plenty, and I know that by the time Saturday gets here, the laborers will be many. Please Join us in serving. Ps. Another opportunity will be on Monday the 31st. At 9 am we will be loading the container! Please pray that it has a speedy, uneventful journey. Bethel’s inventory is nearly depleted. The need is great and they desperately need these chairs!